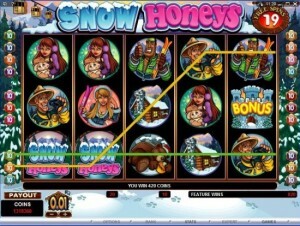 Snow Honeys (Slot Game) was released on 28th November 2007 by Microgaming). The game has a set of 5 reels and 25 paylines. The graphics of the game are bright and colorful with snowcapped mountains theme and snow covered ski resort in the background. The symbols on the reels are theme oriented and include ski instructors, Mounties, hibernating bears, snow bunnies, some ski girls, ice castles and gondola lifts. The highlight of the game is its Free Spin Feature and Hide and seek feature. This slot game has 5 reels and 25 paylines. The coin size varies denominations of 0.01 up to 0.50 per pay line, and wager 1 up to 10 coins per payline bet. The minimum bet amount is 0.01 and the maximum bet amount is 100.00 per spin. The Jackpot payout is of 4,000 coins per line bet. The game features scatter symbol, free spin bonus round and hide and seek bonus round. This game has two scatter symbols which are the Ice Castle icon and Ski Resort Sign icon. When three or more scatter symbols appear randomly anywhere in the three reels, then it completes the winning combination. When three of more Ski Resort Sign icons appear anywhere in the reels, then it activates the free spins. In this game a player can win up to 30 free spins with a x5 multiplier. 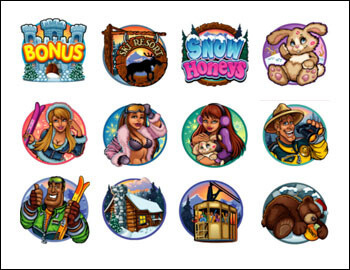 The number of free spins won and its multiplier value depends upon the number of Ski Resort icons that activates the free spins. During the free spins if three or more Ski Resort Sign symbols or Ice Castle symbols appear scattered on reels, then bonus multiplier value on the total bet amount is won. The Hide and Seek bonus game is activated when three or more Ice Castle symbols appear anywhere in three adjacent reels. During this game the up to 20000 coins can be won. 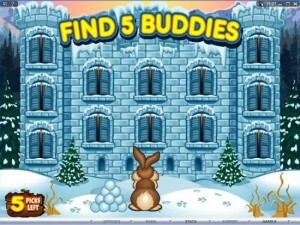 The player gets the opportunity to select five windows one by one among the twelve windows and the bunny takes aim at buddies in the window with a snowball to reveal random bonus amounts that are stored in them. This game is based on Snowcapped Mountains theme and a Ski resort in the background and includes theme based characters on the reels like skiers, ice castles. The game derieves its name from reel symbol of bears hibernatingin snow and holding their honey jars, but the phrase snow honey also points to Ski Girls who are also referred herein as Snow Honeys.